There was no Summer thread but oh well. Here is a chart of what I think is every anime confirmed sorted by Season and anime with air date To Be Announced. Re: Fall 2013 Anime Season -Your Thoughts? I kind of posted my entire thoughts in the wrong thread because there wasn't a Summer one, too. But I don't think it matters so much since it would have been halfway into the season, had one even been made. Also, I know. About this season, I mean. I figured I'd post some thoughts in other threads because there wasn't a Summer one. Also partly the reason I made this one early. And here's something else I thought I'd mention. For Golden Time and Kill La Kill, I'm likely to watch them sometime anyway. So, I'll leave them for a while. As for Yowamushi Pedal & BlazBlue: Alter Memory I'll be honest, I'm probably not going to watch them but they do seem slightly interesting. So, to narrow it down even further, I'll check out Nagi no Asakara and Galilei Donna first because they're original, then Kyoukai no Kanata because KyoAni. When I catch up, I actually do plan on following Pokemon X and Y when it's dubbed, so I don't have to worry about ever catching up to Pokemon again. I will be checking out Kill La Kill. More than likely a few more, at least, since to me, this season really looks a lot more interesting than last. Saikyou Ginga Ultimate Zero: Battle Spirits - The first episode seems to lock out newcomers by not actually showing how to play the game, unlike Sword Eyes just before it. I suppose that kind of thing may have been done in YGO, but they have more comprehensive telling of effects, so it's always been kind of okay. Now, what was going through my mind is that unlike Tsurugi, this new protag does not start from the ground up. He does not start off in some small village, a beginner at Battle Spirits, when he is supposed to be a prince. Instead he is at least 3 different people and seemingly a pro at the game. Um, I'll just have to see what happens. I'll give my thoughts on the Fall 2013 anime season. It looks pretty exciting to say the least. Nagi no Asukara- Not sure what it is about, but I will definately be checking it out. Golden Time - The manga was pretty awesome. Interesting, mainly because the protagonists are in college rather than the usual high school setting. I like how the supporting male lead has a decent backstory, so that's a plus. One gripe I have is that some characters (mainly Koko Kaga) look different from in the manga. I suppose she is a brunette now? Oh well. Mitsuo also has blue? hair. Did not see that coming. Regardless, will definitely be checking this one out. Little Busters Refrain - First season was quite stellar. It presented alot of "mature" themes not seen in a lot of other anime. Has alot of lighthearted moments, but things turn serious when necessary. Not sure where the 2nd season picks up at, so we'll see how things go. Walkure Romanze - Could be funny. Meganebu! - Will check this one out. It's a shojou but focuses on the relationships of high school boys? Hmm. Koroshiya-san: The Hired Gun - Seems interesting. Maybe a good comedy. Noucome - Seems interesting. Maybe a good comedy. Non Non Biyori - Reminds me of Kiniro Mosaic. Could have some lighthearted, memorable moments. I did start Kiniro Mosaic, but I stopped around Episode 2 hmm...It seemed "decent" at the start, but I kind of put the series on the backburner. Tesagure! Bukatsu-mono- Reminds me of GJ-Bu so I am anticipating similar comedic moments. Magi: The Labyrinth of Magic 2 - I've actually heard a lot about how they ruined the anime with the choices they made, pushing Alibaba into the spotlight far more than he should have, even having that anime original ending, but you know, I liked it for that first thing, at least. There is also the fact that it is pretty hard for me to get into the manga, I stopped at about 12 chapters months ago. Usually animation as a whole will keep my attention more than still comics, but I mean it really depends. This is one of those things that I can easily like in anime, so I'll be watching this for sure. Little Busters Refrain[color=#ff3333] - Here is where I keep hearing the story really begins. As if I didn't cry enough already. Should have a more serious tone as a whole, as evidenced by the preview that was showed at the end of the first season. If this is why most people like it, as After Story was to my favorite anime, then I'm putting this above most others this season even after already making sure to watch it. Phi Brain: Kami no Puzzle 3rd Season - I see the likeness of Yu-Gi-Oh! in this, which is probably why I liked it so much despite how repetitive it may seem. I'm not gonna say it's not entirely just a kids show either, along with there being other reasons besides that and sales they would have even thought of making a 3rd season, I'm just really happy. The 2 antagonists so far were pretty awesome guys, too. Which I am really surprised at, because I hate yanderes. Aikatsu! 2 - Let me just say this here as well. Out of the 3 idol anime I've watched, I like this one the most, largely due to how slow the pacing was, letting me get to know the characters far better than the likes of AKB0048 and Love Live, even though I usually prefer seasons to be split into a smaller episode count. I mean seriously, I would not have watched the first season, let alone this, had they been finished beforehand. I didn't even know it would be 50 episodes when I started, now there's another 50? Highly looking forward to it. Pretty crazy, zany fun, simple as that. Looks amazing and distinctive. Whether it decides to continue that route, or help us understand it better like the manga, I'm definitely tuning in. Kyokai no Kanata - I don't like the fact that I couldn't watch a Kyoani show in summer because I wanted more time, and it wasn't nearly this interesting as a whole. Even this looks more interesting than Free!, at least, to me, haha. I'd just like to see what becomes of this. Non Non Biyori - I'm not exactly keen on the character designs, but I'll warm up to them, especially considering how much I enjoyed the manga, when my main interest in this anime is the setting and backgrounds, really. Its setting is not overwhelmingly common, especially not as the setting of an entire anime, so that's what really draws me. And their class, it's so weird having elementary and middle schoolers in the same class, in what seems like the only class in the school. The characters really seem to hold their own against those aspects, providing me with entertainment that I wish I didn't have to wait any longer to get more of. Pokemon is self explanatory. Either I still like it, or I don't. I do. Kill La Kill - I'm not fond of what I've seen of who really looks to be the 'antagonist', but well, providing me with more entertainment than Gurren Lagann as a whole before it even airs is certainly an easy feat. That said, because such a thing happened with Gurren team's next project, quite frankly that's the only reason I'm trying it. But I definitely am trying it, at least. I'm not planning on checking out every single one of these, these are just possibilities I know I'll be checking out at least a couple of. Coppelion - Only the visuals are of any interest to me as of this moment, considering what went on with K, where that was the only good thing, but it was still really spectacular to look at. Golden Time - The light novel is by Toradora's author. That alone would make me check it out for sure, but there are plenty I find more interesting this season and the PV doesn't strike me as being as spectacular as LB's nor Sakurasou's. Strike the Blood - A bit of an Index vibe on the art and animation. Seems interesting, but only mildly so. Yuusha ni Narenakatta Ore wa Shibushibu Shuushoku wo Ketsui Shimashita. - Fudge. I'd like to know the short form of this. Hataraku Maou-sama was about the only thing of this sort I can stand, and what with this taking the comedic route as well, I may just be bothered enough to try it. Log Horizon - If this would be too similar to SAO, I would immediately pass up on such an offer, but what seems like a more laid back atmosphere and a no die-for-real-clause is making this somewhat intriguing. Now this is something that is sure to be called a ripoff of 2 different anime now, but it feels like too much of a coincidence for me to care. I won't be comparing it to either Sword Art Online or .hack (especially since I haven't seen the later) if I do decide to watch it, but I'm glad I'm not active on any of those really active anime forums anyhow. White Album 2 - I'm more than likely to er, well, stay the hell away from the first White Album anime because it'd take a pretty long time to watch for something so very low regarded. But the visual novel of this is apparently one of the best, and I very much like what I see, so I'm more than likely to check it out. Arpeggio of Blue Steel: Ars Nova - Doesn't really sound like anything I've watched as of yet, and I'm happy to see CG on characters looking much better than what Kingdom used to use. Slightly interested. Galilei Donna - Looks good. Sounds weird. All I can say right now. Miss Monochrome - A short to try out since I'm never watching any more of Teekyuu. BlazBlue: Alter Memory - I'm too worried about a fighting game adaption to try this while airing, I'll see what others think about it. Samurai Flamenco - I'm too worried about a Manglobe anime to try this while airing, I'll see what others think about it. Regardless, I think it will be a decent watch if the first season is anything to go by (it is 25 episodes so longer than usual). Viserys wrote: Nagi no Asukara- Not sure what it is about, but I will definately be checking it out. "A beautiful fairy tale that wanders through the earth and the sea. Hikari Sakishima and Manaka Mukaido are Sea Dwellers and childhood friends. When their school in the sea is closed they are forced to attend to an earth's one, but due to a special encounter, their lives gain a new twist." It's definitely not slice of life, like I've seen some people say it was elsewhere. The genres are Drama, Fantasy and Romance (but it might have a Slice of Life kind of feeling) and it's also P.A. Works' next original anime (Angel Beats!, RDG: Red Data Girl, Tari Tari, True Tears). I can say all of us here watched Tari Tari and even if we didn't all love it, I'm sure none of us hated it, so this next one probably won't be bad. Really looking forward to it. Probably the most next to all the sequels I need to watch. Ok, that is interesting...thanks for the background info by the way. Yes, Tari Tari and True Tears were fairly good in my opinion so I will definitely give Nagi no Asukara a chance. Kyoukai no Kanata - Well, for one thing, the entirety of this anime may be just as awkward as that first part was, what with it being a supernatural slice of life, but there are quite a few laughs to be had. I'm looking forward to hopefully encountering some better explaining of what is going on, but will probably be at least decent regardless. Kyousougiga - It is my opinion that this on the other hand, just doesn't need nearly as much explaining as it's just a crazy blast to be had. If it does explain it's stuff decently, possibly like the manga, then much appreciated, but if not, I don't think I care. One thing to note is that with 2 recaps on it's earlier 1 OVA and 5 shorter ONAs, no one that may be thinking about picking this up will really need to backtrack. The first was a pretty great recap too. As for Nagi no Asukara, seems somewhat more interesting now but I can't say it's not odd looking. Yeah I don't know. But I might end up checking it out anyway. Nagi no Asukara reminds me of Ano Natsu de Matteru except with a LOT more water and instead of three girls, it's three guys. So far, I'm getting the feeling the only reason it's part Fantasy is because there are Sea Dwellers, and it could be both Fantasy and Slice of Life (even if they've excluded Slice of Life) or at least feel like SoL, but it could surprise me. Kill La Kill was similar to Kyousougiga, only a lot more overwhelmingly over the top, with a different but probably more cliche plot. I'm surprised but it is probably going to stay as my favorite first episode of the season, but knowing myself as much as I do, it could easily go off into being not as interesting, so we'll just see. Golden Time was surprising but at the same time not. It was a very engaging comedy, but besides changing the setting to collage, there doesn't really seem like much to note, and will probably end up just as average as I had first thought. Yusibu seems to be the short form I wanted. As I figured, it was less funny and more on the fanservice side than Hataraku-Maou sama!, likely to keep up with though since I found it entertaining enough. Log Horizon was very immersive for a first episode, much like SAO, but at the same time, it clearly has a lot of differences, such as swords not being the only weapons. It is intriguing with me being a gamer myself, but it's got the unfortune of being ever so slightly similar to SAO while Maoyuu's author created it, so I am literally wondering why I actually tried it. Hoping it keeps this level of quality, I really, really am. Little Busters! Refrain is starting off, and I am not exaggerating, much better than most of the first season, especially in the animation department. I really got to hate those girls, and they seemed to have done those horrible things for such a petty reason. I am sorry. I wish Kurugaya murdered one of them, at least. Maybe that is a bit of an exaggeration, though. Edit: Honestly, I just barely watched Refrain before posting this, I seriously have to say my favorite so far is it, by quite a bit, after thinking about it. Strike the Blood was interesting. I figured I actually wouldn't try it but from what little I heard about the first episode, checking some opinions beforehand, it was generally all positive, but not that it was really great. I pretty much share that opinion, and would like more information on the protagonist before the events of this episode. Ok guys, its been awhile. I just wanted to give my opening thoughts on the titles I have watched thus far this season. Good, as I expected. So far it stays true to the manga. Its a nice romantic comedy. Based on the manga, its more of a love triangle rather than a harem, so that's a plus, atleast in my opinion. So if you are looking for an enjoyable slice of life, romance comedy, I definitely recommend it. Again one of the few shows that follows the college age crowd. What's not to like. This series is just great all-around and offers a little bit of something for everyone. With the abundance of harems (or reverse-harems) these days I really love shows with a balanced cast. A sequel to the first season, so if you did not watch the first season, you may be lost on the plot slightly. It's a good watch all-around, and I definitely recommend it. Surprisingly good. I really love the tone, and general "atmosphere" of this show. The protagonist is also interesting, one of the rare serious, goal driven protagonists of late. In other words, he knows what he wants and goes after it (at least when it comes to music). The two female leads are likable, no complaints there. However, the dark haired girl has a surprisingly deep voice. That is cool though, I am sure I will get use to it in time. The extremely high-pitched characters annoy me more than anything else. Anyways, if you are looking for a more serious slice-of-life show with promises of drama/romance to come, check out White Album 2. Seems like your typical harem comedy with lots of fanservice. You know, typically the type of show you don't watch with anyone else. The setting is interesting, with the medieval aspects and the sport of jousting, so that is one unique thing about this series. It's a totally watchable show, again nothing like To Love Ru (which is a definite rarity when it comes to raunchiness in harems). So if you like harems, or even just watch them for the hilarity, this is a good choice if you don't have anything else to watch. Unique show with an interesting concept. The artstyle (of the backgrounds and such) seems a little odd at times. With the first episode I had a little trouble keeping interest. I really do hope they add a female main character or side character at one point, because at the moment, it is a sausage-fest. Again, nothing wrong with that persay. It may very well be a show aimed at attracting the female audience, which is perfectly fine. The main cast are interested in women by the way, so no, its not that type of show. It's just hard for this show to reel me in without any female characters. I haven't watched past episode 1 so...who knows where this series is headed. This is a show that puts comedy/hilarity/absurdity at the forefront. Basically, the protagonist has a "curse" in which he is randomly given a choice of two options in any given situation. These choices often don't make any sense, but hey, anything to get a laugh out of the audience, right? The show is fairly funny at times, but I admit the "choices" sometimes feel forced at times. It's hard to drop a show that makes you laugh, in my opinion at least. For delivering laughs it is pretty good at its job. However, the dark haired girl has a surprisingly deep voice. Probably the only thing I found annoying so far though, to be perfectly honest. I'm probably just more used to the other end of the spectrum, but I don't think any of the guys or really the other main girl was really that high-pitched. The only ones I'm not sure about would be that one other girl and any randoms that may have passed by. There isn't really anything else I can't agree with, though. Aikatsu! 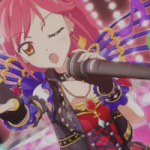 2 - So we've got a rocker idol and Ichigo back with cute cat ears a week year after last season ended. The funny thing being in the aphorism thing at the end there Aoi broke the fourth wall in saying it had been a week er, year. Galilei Donna - Feels like it's a bit too much in what it's trying to do, but with the oddity of a goldfish mecha it is entertaining enough for 11 episodes. Magi: The Kingdom of Magic - I did not understand what was going on at first but that is because what it showed before the opening is not happening right away. I just hope it doesn't rush too much to get out to that or anything. Going on different journeys might they all actually get the chance to do so seems interesting, and episode 3 was hilarious. Phi Brain: Kami no Puzzle 3rd Season - I'm just glad we don't seem to have another Rook/Freecell on our hands this time. Like I said before airing they are both pretty similar characters and for both being antagonists, both of them, that was not exactly a good thing. Much fun. Yep. I feel like I'm not saying much right now but Jin is being confusing and the whole anime season has just been started. I dropped the current Battle Spirits on the account of feeling way more childish than Sword Eyes. Whereas Sword Eyes may not have had great character development, at least I felt it had character. Non Non Biyori - This has so far been everything I had thought it would be. Gorgeous scenery, not so used setting, decent characters all around, lovely slice of life. All I really need to say. Arpeggio of Blue Steel: Ars Nova - I had hoped this would entertain me with naval battles considering that isn't a thing I have yet seen done in anime. After the decent set up with the first episode I had pretty much gotten what I asked for with the second, am slightly behind in things now though, I know the third episode aired. The CGI has a lot of problems with it and that is not so good considering this is full of it, characters included, but I just go with the flow considering I'm getting what I want, and it's a step up from several other things I have seen. Miss Monochrome - The idols have invaded the short length anime. Haha but no, a pretty washed out robotic idol that hasn't sung except for maybe the ending. First episode was funny because of what happened, I didn't find the second one any good, really, but the rest have been okay. It's really only 4 minutes long each episode, less if you don't bother with the ending (there's nothing after it, as far as I can tell from the first episode, so I didn't bother. Incidentally, I didn't bother after that not just because of that, but because, it seems kind of unheard of for there to be anything after an ending theme to a short anime). Imo, worth it if you've only got such a short amount of time on your hands, but I know there are funnier shorts, and that is mostly all you can do with such a thing. EDIT: Non Non Biyori episode 4 - Oh the feels! Oh the poor poor Ren-chon! Oh the forgettable brother! Really felt like crying, especially when seeing that long sequence of Renge starting to cry. I need to catch up on Non Non Biyori (only through episode 1). This seems like a knock-off of Going Home Club and similar anime that feature an all-girl cast. From what I have seen, it seems to CGI animated? Similar to RWBY, to make a comparison. It's a half-episode anime it seems like (approx duration 12 min or so). Now the first episode, it had trouble keeping my attention, but things may get better later on/funnier. I won't be so quick to dismiss this one yet. Kill La Kill is more than just some action thing... I have to say after the first couple episodes it's falling within my new expectations that it is absolutely nothing amazing. I am caught up to it, with 6 episodes out, and it is still over the top in it's need to be over the top with everything, including fanservice, meaning it is... well... probably going to be one of the most fanservicey anime I have ever watched by the time that I'm done with it. It really is too much to handle, and I handled To LOVE-Ru (although I was younger and I didn't dislike the art style, would still say it doesn't actually outdo To LOVE-Ru in that aspect) relatively okay. White Album 2 is still actually pretty much the same, I just wanted to mention how something about Haruki going on about that song (episode 6) made me laugh for some reason... It's another really solid musical anime, like Tari Tari, really. Although I will say there definitely seems to be more drama at this point in time, I like these things either way. Golden Time - From the beginning, and even before that with just the trailer, it didn't really look like anything special to me, but from episode 4 onward, at the point where apparently the manga translations stop, I did change my mind. It's reminding me why I did enjoy Toradora so much, and now that I realize how strong this is, it does make me appreciate the setting not being middle or high school (I think it's safe to say that due to there being some drama, there isn't really any way to create a believably similar plot with elementary school students, but I mostly see middle/high schools anyway. Especially high schools). I thought about how the whole Linda thing is even going to resolve, and it probably won't go in anyway I can think of, except I will guess that it will resolve in a happy way that will actually resolve things. Well, hopefully, but what seems obvious is that Banri and Koko will not just get together, but by the end be together and stay together. I mean, I just can't see it not being that way with the way things are going and the fact that Banri is the protagonist and Koko is the main heroine. Truly one handful of a women, though. is actually the bad guy. Really the only thing I feel is mentionable, but does this ever make me appreciate the show more, with the antagonist being an actual different character either way. Galilei Donna - I don't think the opening or ending is really one of the best this season, it just looks awkward and provides basically the only fanservice the youngest sister gets, so no. Solid series though, I can say, Goldfish mecha and all that death (not actually much, but it seems there in the latest episode) unlike most of what I'm watching this season. Even Log Horizon (not really a spoiler) has people able to respawn but it barely even shows anything of the short, and the main characters haven't died yet despite there not being as much danger as actually dying. lol I already made a Golden Time thread but what I said about it ended up being the longest. Nice thoughts, Seira, you make some good write-ups I must say. Low and behold, you seem to be watching more total anime than I am each season. It's really hard for me to jump around, though most series I start I do finish. Noucome - a fanservicey kind of funny. Yes, despite the harem setting, unrealistic nature of the "choice" selection and everything else, I do manage to get a few laughs out of the show. That's a plus in my book. It is general absurdity and randomness though. Good for comedy, not so good for a meaningful plot. Meganebu! - I did stop around episode 2 or so...Again, I Don't know if this show picks up. I guess being a male, all-male cast members shows just bore me to tears. Likewise, I didn't watch Swim! (the swim anime I may be off on the name) of last season, as I heard it was quite fanservicey. If they could introduce atleast 1 female side character or main character, I would like the show alot more. Again, when the entire show is one gender (male in this case) it just makes for an utter snooze fest. I definitely have no problems watching reverse-harems or shojous at all. Walkure Romanze - Typical harem protagonist, typical swooning women all over him. Good for laughs though. The whole "jousting" theme with the knights is interesting. I suppose that gives the series more "tension" than your typical harem. I just can't do short hair like that. Why?? Why did she cut her hair? Definitely reminiscent of Stella's Women's Academy. Simply put, I am not one who is fond of short hair on women. Though, Asuka from KNIM is probably an exception. That being said, I doubt a real woman could pull of her hairstyle and still look cute. Shoulder length hair is surprisingly attractive, but boy-ish cuts? No thank you. Viserys wrote: Nice thoughts, Seira, you make some good write-ups I must say. Free? I did end up noticing that there was a female or 2, but I don't know her importance since I haven't actually watched it. But I guess that isn't why you mentioned it. I just accidentally this spoiler. Will spoil my comment because it also gives away the spoiler. I agree with it being that short, not my thing either, but if it isn't twintails (guess I just let one of my "fetishes" slip) I generally prefer shoulder length... on anime girls. Real women, I don't actually care, for the most part, and I'll honestly just be okay with however they decide to style it, for the most part, but that has a little to do with just plain mostly seeing undone long hair. I'm not spoiling anything that isn't exactly in synopses, but having too many long posts is going to be a pain. This one is littered with anime and manga references and being all "anime, manga, and video games are like the best things ever, dude." There are a lot of knock offs of TONS of anime, manga, and video games, especially visual novels, it isn't outright referencing, but there are a lot of obvious ones, especially the magical girl ones in the first episode. Pretty hilarious too. The protagonist, Shinichi Kanou, is an otaku who decided to go for an anime quiz of sorts online. He gets a perfect score, and went to see what the job that the ones who put the test up wanted someone like him to take even was, which turns out to be an ambassador of not just Japan, but of purely otaku interests to the Holy Eldant Empire, a country in a fantasy world, pretty much. I actually find the majority of the characters likable and as I've already said, surprising really funny, so it's great. Seems to fall victim of being a parody of sorts, so as I've said a couple of times already, highly unlikely it can actually be one of my all time favorites, but it's actually very enjoyable, with less fanservice than I had originally thought (for some reason), to boot. I finally decided to try Nagi no Asukara thanks to this nice person, right here. I agree. A lot of slice of life elements, and it is very dramatic for a fantasy, if you can even call it that. Usually it's more on the action and such side of things if you count something as a fantasy. I get sucked in from start to finish, every episode, I am astonishingly speechless. Great character development, absolutely beautiful art, can't wait for the next episode, just so easily climbed in my favorites of the season. Btw Ano Natsu de Matteru had 3 guys too. I would also say it has 4 girls. In terms of main and important enough side characters. MAL actually has 6 characters as main and 4 of them are girls. But that has nothing to do with this, I guess. Hmm...interesting. That is one title I have not checked out this season. So little time, so much anime.